NEW YORK—New Yorkers make 19,000 trips over the city’s four East River Bridges every day, so the city is looking at ways to make the trips safer. The Department of Transportation announced a Bikes on Bridges campaign Thursday, at a City Hall hearing. DOT will study the 15 Harlem River crossings to find ways to make cycling safer. DOT will then make short-term fixes that will guide capital improvements when the bridges are rehabilitated. “With these improvements, we can significantly enhance the cycling experience in upper Manhattan and the Bronx,” said DOT Commissioner Polly Trottenberg. New York City was named the best city to bike in this year by Bicycling Magazine, up from seventh two years ago. From 2013-2013, cycling has quadrupled in the city. New York currently has 960 miles of bike lanes, including 35 miles of protected lanes. The goal is to add 50 miles a year, and double the amount of cycling trips in the city by 2020. Much of the increase in cycling has been due to bike-share program Citibike, which was recently sold to a private investor and is undergoing changes to make the system more reliable. As part of its contract with the city, the program will double in size to 12,000 bikes at 700 stations by 2017. Earlier this month, the bikeshare program’s new parent company hired a new Vice President of Technology to work out the kinks in the system. 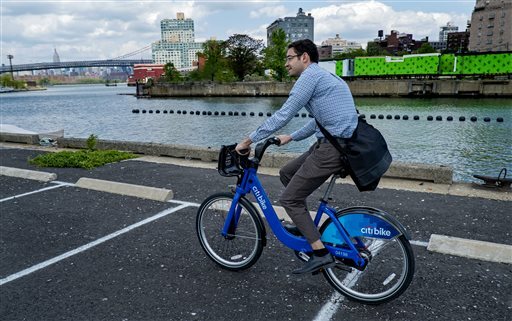 Complaints of faulty docks and credit cards not being read have plagued Citibike since its inception, and Trottenberg said these issues need to be addressed in order for the program to expand. The next step is negotiating at the neighborhood level. DOT is already talking to people in Brownsville, East New York, Long Island City, Ridgewood, and just recently Bushwick, to determine where lanes and bike racks should be placed in a way that works for the neighborhoods and allows cyclists to get from one place to another in a way that makes sense. Five of the 50 miles of bike lanes installed every year will be protected bike lanes. In areas where protected bike lanes were installed, injuries for all roadway users—pedestrians, cyclists, drivers—decreased by 20 percent, according to a DOT study. “They are safe, innovative, and increasingly the standard used in cycling cities throughout the world,” Trottenberg said. Ten years ago, DOT released a cycling fatality and injury report that has been the base of the city’s work in creating a bicycling friendly city, the commissioner said. Next year, DOT will release an updated report. NEW YORK—Citi Bike will install new stations in the outer boroughs and double the number of bikes by 2017.